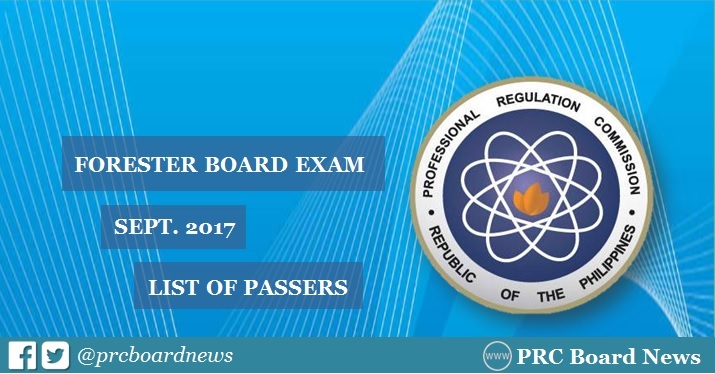 MANILA, Philippines - The Professional Regulation Commission (PRC) and the Board for Foresters released results of September 2017 Forester board exam on Friday, September 15 or in two (2) working days after the last day of exam. The complete list of passers, top 10 (topnotchers), top performing schools and performance of schools are available on this page as announced online. UPDATE: 721 out of 1,482 passed the Forester Licensure Examination. PRC administered the forester board exam on September 12 and 13 (Tuesday and Wednesday) in the cities of Manila, All Regional Offices and Zamboanga. The recent Forester board exam covered the following subjects: forest ecosystem, forest policy and governance, forest engineering and utilization and forest resources management. Based from PRC Resolution No. 2016-1019, the target release date of the recent Forestry board exam results is on Friday, September 15 or in 2 working days after the test. In September 2016 exam, results were announced in two (2) working days. A total of 633 out of 1,370 (46.20%) passed the exams. Meanwhile, results were also released in 2 working days during the August 2015 exam. PRC named 461 out of 961 (47.97%) passers of the Forestry exams. We have to take the mind for the limitations of the speeds on the all races of the mountains with the bikes of the counterparts. Difference of the combinations for the more to http://www.personalstatementservices.org/how-to-write-a-law-school-personal-statement/ also is limited for the rotating time. Smartphone users always want to get best featured designed device for their use and this info is very helpful for buyers. We can also hire help from http://www.thesisdefense.org/dissertation-defense-and-thesis-writing-help/ on any time with use of our smart devices. official result is done for the struggle of the people. The enhancement of the goals and check that for the approval of the items. The change is done for the suspected items for the candidates.